See if this sounds familiar….. Your kids love art and all kinds of artsy, crafty projects. But if you’re being honest, you’re not a huge fan. Oh the mess! The spills, the paint, the drips, and the smears. And let’s not get started on glitter! Oh, glitter makes me cry. Is anything worse than glitter? No, I really think not. So, if you’re a tired mom like me, then you need yourself some mess-free art supplies. And I have exactly what you need. I’ve found the “Holy Grail” of painting products! 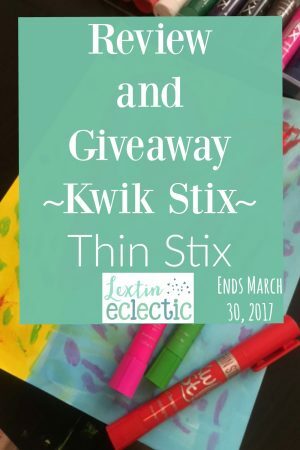 I was thrilled to work with Kwik Stix again for another review and giveaway, because these things are my favorite! They were generous enough to provide me with a set of Kwik Stix Thin Stix for this review. So, what are Kwik Stix? They are solid tempera paint packaged in a nice little tube. Open the top and start painting right away. No brush. No water. If you need more, just twist the bottom to have more paint. And they dry in record time too – like within seconds. When your kids are done, put the caps back on and you have lovely artwork and zero clean up time. My kids say it’s like painting with glue sticks. Believe it or not, they think it might be the best thing ever! Then Kwik Stix came out with neons. LOVE! Next was metallic colors. I really need those! Now they even have the Thin Stix. Guess what? We loved them! So, go get yourself some of these right here and then come back and read why these are so wonderful! These new Thin Stix are just as amazing as the regular Kwik Stix, but are a great size to be able to paint more details. They glide smoothly on the paper and leave an even coat of bright paint colors. While these may be thinner than regular Kwik Stix, they are still easy for small hands to hold and maneuver. I asked my kids which kind where their favorite and they insisted that they could not choose. They said they really *needed* both sizes – one for all the big stuff and backgrounds and the thin ones for their details. According to them, these are necessary art supplies. My oldest children (ages 11 and 9) enjoy painting with these. They love that they can make a quick painting that is ready to mail to friends and family within a few minutes. My younger children (ages 7, 6, and 4) are huge fans. Their favorite aspect of these paint sticks is that they can use them unsupervised because I don’t worry about messes. They paint with them for hours at a time. This gives me hours of silence. It is wonderful! This time we used our Thin Stix with watercolors. I had a brave moment and got out some water, paint, and brushes. My kids made designs with their paint sticks and then painted over the picture with watercolors. The watercolors didn’t mix with the Kwik Stix (which were already dry by the time they began painting), and they had a beautiful watercolor resist painting. So, if you want to be a fun artsy mom, but just can’t handle the mess – your problem is now solved. And if you want to courageously branch out and do some mixed-media art, then you’re covered there as well. We’ve even used the Kwik Stix on paint canvases to create pictures for the playroom. It was awesome! These paint sticks are as versatile as they are easy to use! And don’t forget to enter the giveaway at the bottom of the page. You can enter to win your own set of Thin Stix. Hurry because the giveaway ends on March 30, 2017. This giveaway is open to residents of the U.S. only. Void where prohibited by law. Must be at least 18 years of age. This giveaway is not associated with Facebook, Twitter, Instagram, or Pinterest. No purchase necessary for entry. Selected winners will have 48 hours to respond to email notification to claim their prizes or another winner will be drawn. I have these on my wish list! So need to splurge and buy some! Thank you! You so need them! They are so great! I know! My kids paint away with their sticks and they make some amazing pictures! I was very impressed. Bryanna would love these!! She is my artsy one and loves paints. These would be perfect for letting her just go at it!! Oh and she would love the neon stiks. She loves bright colors. Yes they would be! I don’t have to stress when my kids use them. I love it!! Lexi, this is me to a “T”! These sound fabulous! I think Daniel would like the thin Kwik Stick best. Yes. He would probably love the thin ones. The neon ones are fun too. I’m hoping they’ll make thin ones in neon and in metallic! I am considering homeschooling. It is a scary thought for me. I often wonder if I can do it but I am leaning more and more in that direction. It can be a bit overwhelming to begin homeschooling. But it is certainly doable! There are many wonderful resources available to homeschooling families. I think my kids would like the Thin Stix.